For generations my family has eaten rømmegrøt (Norwegian cream porridge) for Christmas Eve supper, and I am not going to let Type 1 Diabetes take that away from us! 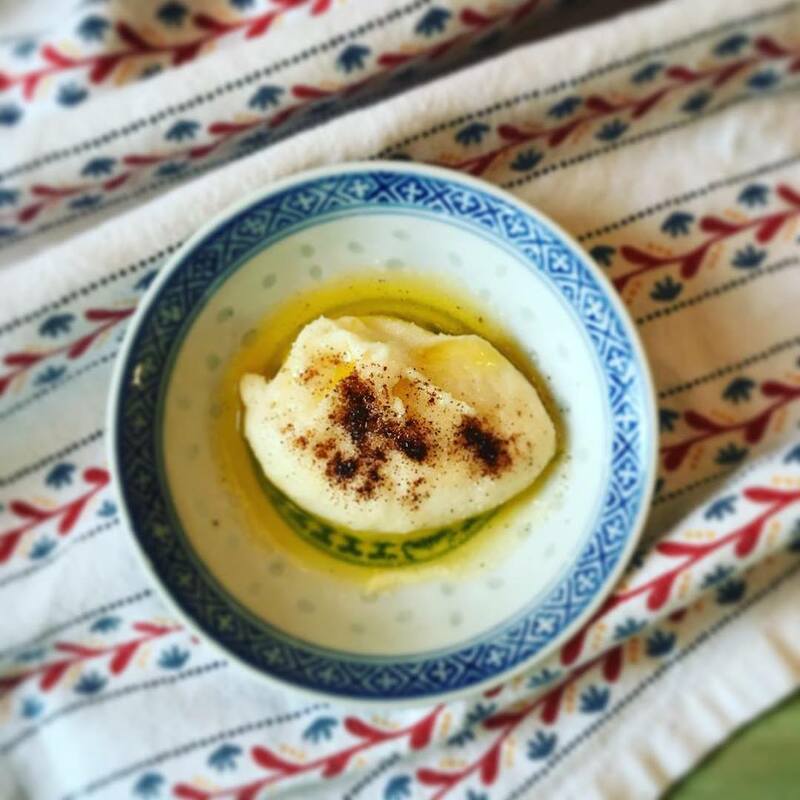 I made a ketogenic version of my grandfather's recipe and you can find it on my website: https://www.ateliermandaline.com/updates/december-24th-2017. I hope you and your family enjoy it! My Atelier Mandaline shops are taking orders but I will not resume shipping until December 28th and there may be a delay in response to questions. Get It Under The Tree! December 18th is the last day to order items so they are sure to arrive in time for Christmas if you use standard shipping. Therefore, everything in my eBay, Etsy, and Poshmark shops is marked down through the 18th. Please note, this is for ready-made items. Message me to see if I can complete any custom orders in time. I have to tell you, however, I am pretty swamped with customs right now and won't be able to take on many more. You know, it's kind of maddening. Every year I attend all these webinars and read all sorts of trend reports on eBay and elsewhere so I know what kind of inventory to stock for the holidays. This year leggings, sweaters, pocketbooks, and toys like LEGOs were the big trends. Florals, velvet, and folkloric and handmade-looking prints were supposedly all the rage. So I filled my shops, especially my Poshmark boutique, with these. I know from long experience that doll and trunk sets sell well during the holidays and this year I made six, which is nearly twice what I've produced other years. They all sold out by the first week of December, the earliest I've ever sold through them! The leggings, especially the LulaRoe leggings, are selling at a healthy rate as well. However, eBay and Poshmark and everybody else missed an enormous trend this year: Do It Yourself crafts. I suppose in Poshmark's case that's understandable as they only sell fashion. ​I have tons of dolls, both vintage and modern, ready to go in all my shops, but they aren't really moving. Instead, I am stunned by the demand for supplies, such as doll eyes, crier boxes, and stringing kits, this year. I am selling out almost weekly in some cases. I really wish someone had recognized this trend because I could have been more prepared. For instance, instead of finishing dolls I wish I had put together more doll-making kits. I can't keep eyes in stock, especially. American Girl eye swapping is a huge deal this year, so my handpainted eyes have really been popular. Was this mentioned anywhere? No. I could have painted a whole bunch of eyes ahead of time so I could provide custom styles more quickly! So, if you're in trend forecasting, please... try a little harder to think outside the box next year. Not everyone wants to give the same old, same old! Head to my website to link to all my shops and save big. Even Young Living has many sale offers happening now. Save even more on Poshmark when you sign up with code STUDIOMANDALINE and get a $5 credit. 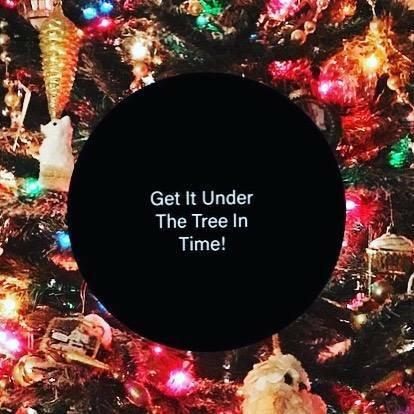 Just remember, if you need it under the tree on Christmas morning, order by December 18th! This past summer, for our oldest son's high school graduation, we went to Florida and visited Disney World and Universal Studios. Harry Potter World was a big favorite of the entire family. We only got to visit the Hogsmeade and Hogwarts part; Universal charges you twice to see the entire world and we couldn't afford it. Hogsmeade and Hogwarts are absolutely amazing, however. If you're a fan I definitely recommend it. Of course besides riding the rides we had to shop in the stores and eat at the Three Broomsticks. Honeydukes candy store was a hit with the kids and they each got a treat. I managed to save the containers from Honeydukes, which look just like the boxes in the movies, and get them home safely (this post could also be called "Ways I drive my husband crazy"). 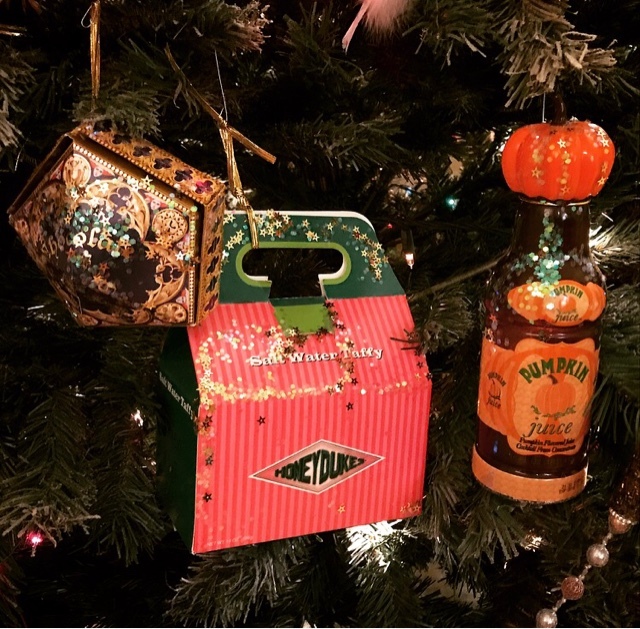 We were on a strict budget during this vacation and as much as I would have liked to let everyone choose a Christmas ornament to commemorate the trip it just wasn't possible. 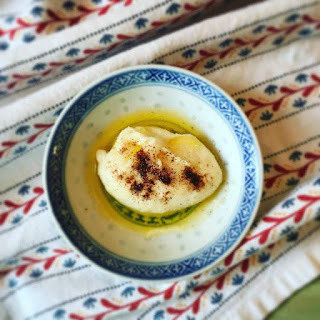 But I thought, why not make our own? It seems like I'm always getting cool packages on various vacations, which I'm sad to throw out. I am glad I thought of this way to upcycle these neat containers and memorialize the trip at the same time. 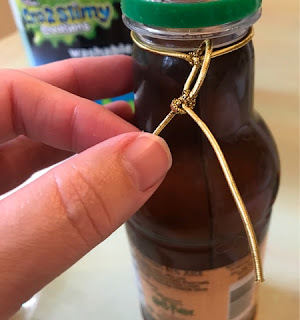 This is a fun craft to make with your kids. To begin, you need to thoroughly clean your container if necessary. 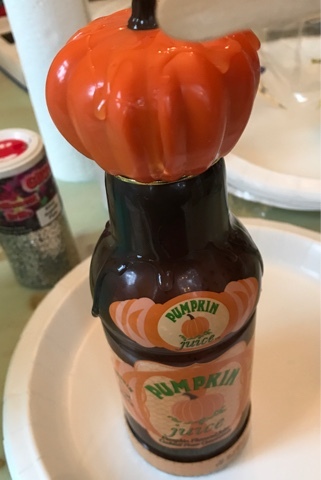 This jar of pumpkin juice was just so cute, I hated to throw it out. I washed it out well to make into my youngest son's ornament. 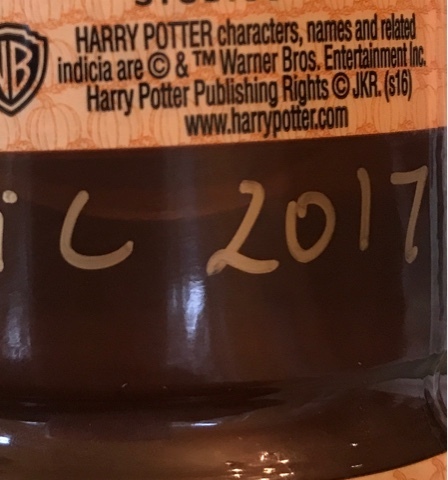 Pumpkin juice was his favorite of all the Harry Potter foods so I know he will love it. I wanted it to look like there was still a little juice in the bottle (but not too much because it would be too heavy for the tree). I also had the idea of making it like a snowstorm with glitter. 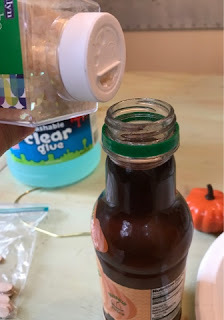 I filled the bottle about a quarter of the way with rubbing alcohol and water, to make sure the water doesn't get moldy. 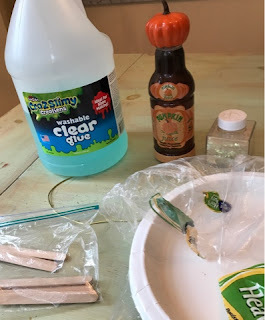 Please excuse the extreme close-up photos in this post; at this point my son came home and scattered books and orange peels and papers all over the table where I was working and I only had a tiny uncluttered window in which to take pictures! I added glitter to the water and then added a few drops of glycerin, which helps to keep the glitter suspended and keeps it from clumping together too much. 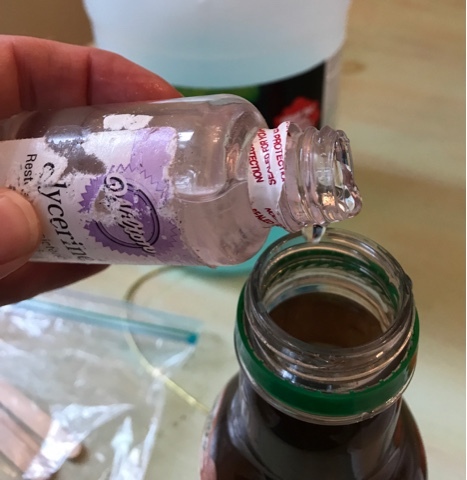 You can get glycerin in the cake decorating section of craft stores and also at some drugstores. 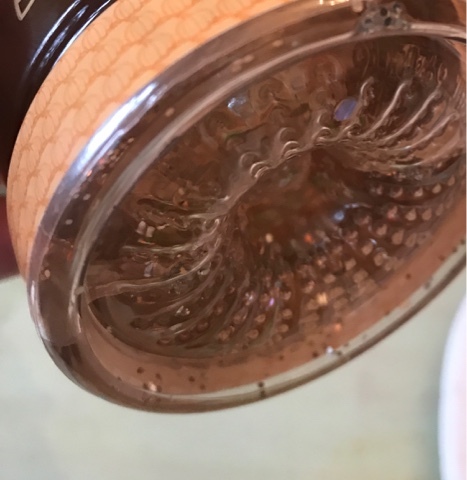 I had trouble getting the glitter to show in the photos but you can see it swirling around. Add the child's name and year. Without tipping the bottle too much I wrote my child's name and the year on the ornament. Then I tied on a hanger of elastic cord. The cord is under the bottle cap, so I added it first. Then I coated the cap with glue and screwed it on. I glued the lid so the water won't leak out and so no one will mistake this for real juice and drink it. 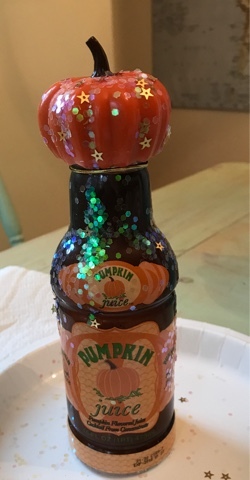 To make the bottle look more festive for Christmas I decided to bling it out with glitter. My mother didn't think the pumpkin juice made a good Christmas decoration and thought I should use it for a Halloween tree but I am confident I will never get around to putting up a Halloween tree. Decorating for one major holiday is the most I can manage! I dripped glue over the bottle with the idea the bottle would look like it was frosted by snow. 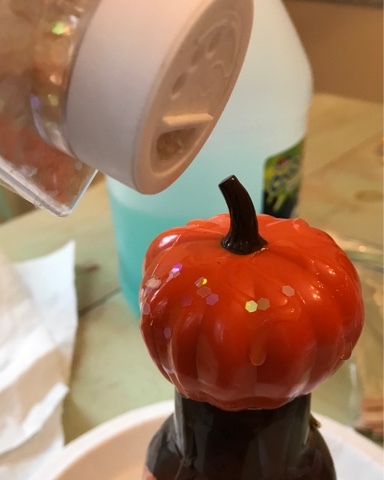 I sprinkled the wet glue with iridescent glitter. 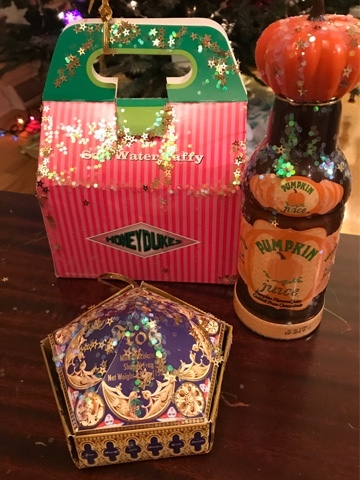 I found some star-shaped glitter and decided that would be good for Christmas as well as the magical theme of the books and movies so I added that too. Then I let the bottle dry. 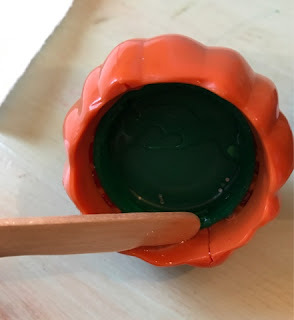 I made these ornaments as a surprise for my kids, but as I mentioned, this is a fun and easy project your kids would probably really enjoy doing with you. I went on to make two more ornaments for the other two kids. I originally thought about trying to make a pop-up frog to go in the chocolate frog container, but I am just way too far behind for that. This is such a busy time for me and I knew I should have worked on these in the slow summer months but as usual I procrastinated. As you can see, we already have a few Harry Potter ornaments! 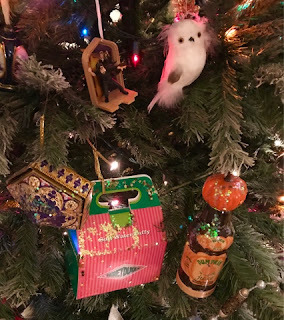 I used to let the kids each pick a new ornament every year but our tree is so full it is beginning to look like it might fall over so we've been doing one family ornament instead. I have always wanted to do a kids' tree. To be honest I wanted to have the downstairs tree be more decorative with all matching ornaments, but it just didn't happen that way. The past couple years I had a mini tree in our upstairs landing which the kids decorated with ornaments they made but this year when I went to buy the mini tree I found they cost about $60 instead of the $12 I was expecting! So that went out the window! Once when I was little my mom took me to a Christmas show with all kinds of trees decorated in different themes. One tree was a "Sugar Plum" theme and all the ornaments looked like pieces of candy or cupcakes or ice cream cones and all had plastic "sugar" crystals sprinkled over them. I thought it was the most wonderful tree I had ever seen! I would love to have a Sugar Plum tree one of these days and I think these Harry Potter ornaments would fit right in! 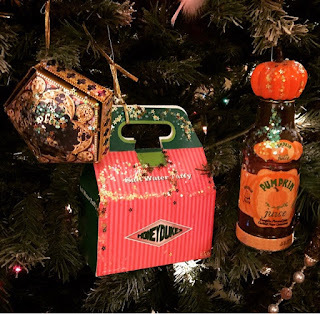 I hope the next time you get a special box or container you might be able to upcycle it into an ornament for your family!